Jellycat Fuddlewuddle Lion has such gorgeous fudge fur, we think he tumbled into a tub of toffee, but that doesn’t explain his lovely amber mane! 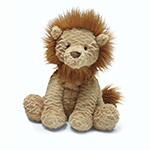 This squidgy-soft lion is silky and sweet, and though he’s meant to be fierce, he’s really a vegetarian! His favorite treats are jelly gazelles. Pair it with Jellycats "The Very Brave Lion" book (Sold Separately) to make a wonderful Birthday, Baby Shower, or Just Because gift. Jellycat - Irresistibly Cuddly, Sophisticatedly Silly & Hilariously Humorous!